This post will help you get Paybox integration to work using node.js. You can find a full working example in the src/paybox-integration dir of my blog code repository. 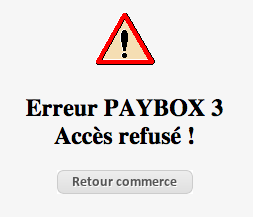 Paybox is a French payment provider. Getting their integration to work can be quite a hassle. The simplest way to get payments to work, is to generate a form and post it to the paybox servers. This form must contain an HMAC signature based on your private HMAC key and the form data. It is rather tricky to get this right. Unfortunately, if you do anything wrong with your form, you get a generic – and totally unhelpful – error message. This does not help you debug your code. Using the data in this form, you can figure out whether your HMAC algorithm is working correctly. We used the node-paybox module, which looks not that well maintained, but it works well. // Do not include colons (":") in the payment id (PBX_CMD). // with the : not properly being URL encoded. Hopefully this will help you in getting Paybox integration to work. For a working example, see the src/paybox-integration dir of my blog code repository.